FANTASTIC PRICE REDUCTION! You won't want to miss this one. Clean happy and cheerful - that's what you'll find the minute you step into this well maintained home. 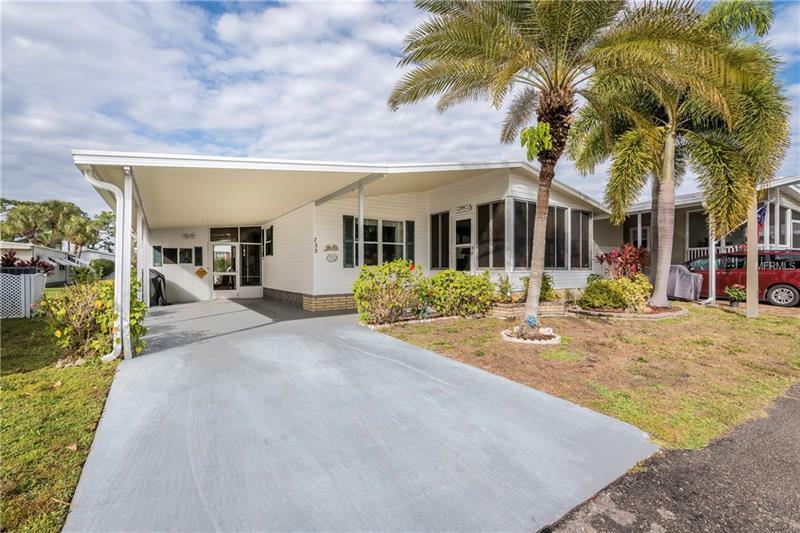 With TWO sunny spaces to enjoy the sunshine and outdoors one enclosed lanai on the front with newer windows and flooring and one screened area of the carport you can relax and unwind after a long day of enjoying all that the Maple Leaf active lifestyle has to offer. The owners have updated the flooring with laminate and vinyl and the home has fresh calming paint colors. You may not want to leave your Florida retreat whether you are seasonal or year round residents. This gem has two bedrooms and two baths. The kitchen has plenty of room for making mealtime fun with more than one cook in the kitchen plus a breakfast bar. The home is being sold furnished with some exclusions. Home price includes $40000 membership certificate/share. Located in an award winning resident owned 55+ gated golf course community with an active resort lifestyle. Features a par 62 golf course 5 tennis courts bocce ball lawn bowling 2 shuffleboard courts 4 heated swimming pools 2 hot tubs fitness facility woodworking facility 75+ clubs/activities 2 pickleball courts restaurant with full service bar and more. Sorry no dog allowed at this interior lot location. Shown by appointment 24 hour gated community. Not in a flood zone and no CDD tax. It's all about the lifestyle in Maple Leaf. Pet Restrictions: 1 indoor cat only at this location. NO DOGS at this location.